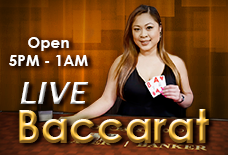 For the first time in New Jersey online gambling history, live dealer baccarat is playable at a regulated online casino. This 19th century game with French origins benefits hugely from the excitement that a live dealer brings to the table. Baccarat is a pure game of chance and luck – although the superstitious may disagree with that assessment. It also boasts one of the lowest house edges of all casino games, meaning your odds of winning as a player are pretty good comparatively. Currently, only two online casinos in New Jersey are offering live dealer baccarat – GoldenNuggetCasino.com and Betfair. Live dealer baccarat brings casino gaming directly to your living room, and since a person is dealing to you, it’s encouraged to chat them up just like you would do in a live casino. When playing live dealer baccarat online, there are different rules on how to handle errors and technical difficulties. General issues like a dealer error are dealt with by the on-duty floor manager; a pop-up message will alert the players and halt game play until there is a resolution. Another commonly encountered problem while playing with a live dealer is internet disconnections. No one’s internet is perfect, and disconnects are rather common. The Golden Nugget’s policy when handling disconnects is fair and makes it easy to pick up where and when the log off happened. Live dealer supplier Ezugi and the NJDGE both ensure these situations are dealt with in a way that pleases customers. To place bets on a live dealer baccarat game, you select the amount you want to bet and put it on the interactive table in front of the dealer. There is a countdown timer to make sure decisions are made in a timely matter, and that the game keeps flowing. Since these are real dealers, there is often a wait to join a table for this unique online casino experience. In live dealer baccarat there are two hands that are dealt; one to the player, and one to the banker. Players place bets on which of the two hands will end up closer to nine, or you can bet on a tie. Live dealer baccarat at the Golden Nugget is played with the standard eight decks of cards. These decks are constantly being shuffled by the live dealer. After the first two cards of the hands are dealt, the cards are compared to see if either hand has the value of a natural eight or nine. If neither hand is a natural winner, both the player and banker can redraw for a third card. When the last cards are drawn if both the hands are tied, both the player and the banker get refunds. To determine what hand is closer to nine you must be able know the card values for baccarat. Ace equals one, all face cards plus tens are zero, and any other card is just the value of the card. The reason for the banker paying out less than 1:1 is because the banker wins more often than not, and to make a profit on banker bets the casino takes a 5% commission on these wagers. Even after the 5% commission, betting exclusively on the banker is still the baccarat bet with the lowest possible house edge in the game, and betting on the banker is actually one of the lowest house edge bets in any casino game. The only “bad” bet from the perspective of house edge is betting on a tie, but if you’re having fun and feeling lucky, sometimes you can get lucky and receive a very nice 8 bets back for each 1 you placed. If you’ve never played Baccarat before, it’s one of the easiest games to start playing – the “correct” strategy is simply to bet on the banker. Like Roulette, you can’t really go wrong as you can in a game like Blackjack where your strategy can have a huge impact on how well you do. The specific variant of baccarat available at GoldenNuggetCasino.com is Dragon Bonus Baccarat. If you ignore the Dragon Bonus side bet, the game operates exactly like standard baccarat as described above. You can place a Dragon bonus bet on either the player or banker hand, and in order to place one you must also be placing a standard wager. The Dragon Bonus is a fun side bet, but playing it increases the house’s edge on baccarat. The safest way to bet at baccarat will always be to ignore side bets and only bet on the banker, but once in a while it’s fun to see if you can win 30x your bet!